Well, it’s Lyme, MCS, Fibromyalgia, ME, and A Bunch of Other Diseases Awareness Month again. Wow, that year went fast. What a strange time it’s been (extreme understatement). While the political landscape may be ever-changing, Lyme disease awareness is still the same — very bad, awful, terrible. There has been some good media coverage, such as the series Lyme and Reason. But there’s still a long, long way to go. The number of new cases will continue to rise because of warming winters. I’m reading about this in “Lyme: The First Epidemic of Climate Change” by investigative journalist Mary Beth Pfeiffer. So far it’s a great read. It’s surprisingly easy to understand, even with brain fog. The link I provided is for the hardcover and Kindle versions, but it’s also available on iBooks. 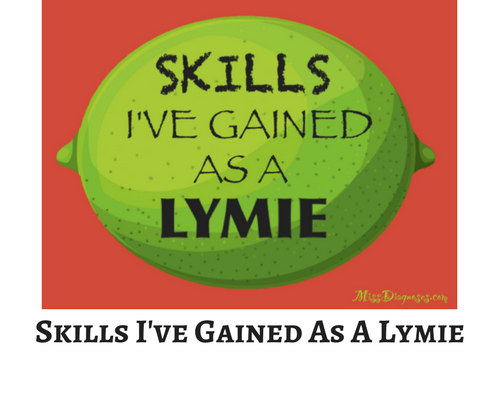 The Lyme Disease Challenge started a few years ago as an ingenious, fun way to raise Lyme awareness on social media and elsewhere. Embarrassingly, I haven’t done it until now. The idea is vaguely similar to the Ice Bucket Challenge for ALS, but less frozen and more citrusy. You take a picture of yourself or a video of yourself biting into a lime, share a fact about Lyme disease, tag three friends, and donate $10 to a charity. This year the charity is Project Lyme, an organization dedicated to raising awareness and promoting research. Alternatively, you can skip the picture-taking and donate any amount you are comfortable with (suggested donation is $100 but many spoonies don’t have that to spare). I also made a little meme to go with it. I’ve been thinking of trying to create memes ever since joining Instagram (shameless self-promotion alert). I’ve been afraid to work with type, as I can’t use programs that require a mouse because of my repetitive strain injury. That rules out most fancy design programs. I made this in my little free iPad sketch app, so be kind. 😀 I had fun turning the letter S into a spirochete. 1) Children are at the highest risk of contracting Lyme Disease and are more vulnerable to central nervous system infections. 2) Transmission of Lyme Disease and other infections can take place in a matter of minutes, particularly if the tick is not removed properly. 3) Lyme Disease has been called “The Great Imitator” and can be mistaken for ALS, MS, ME/CFS, fibromyalgia, Alzheimer’s, Parkinson’s, autism, and other illnesses. 4) Research suggests that Lyme Disease and other infections can be spread from mother to baby during pregnancy. 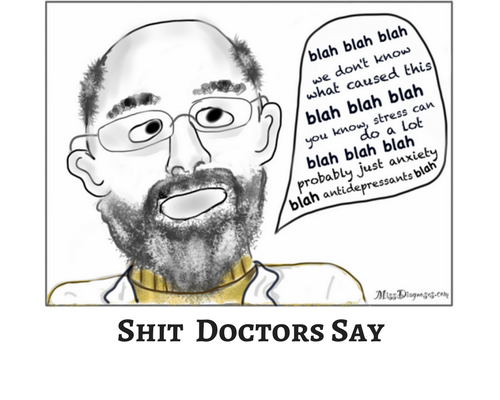 5) Studies show that standard laboratory tests recommended by the CDC to diagnose Lyme Disease miss approximately half of actual cases, leading to misdiagnosis and an infection that is more difficult to treat. 6) Over 63% of patients treated for Lyme Disease continue to suffer symptoms that can be debilitating. 7) The CDC estimates that there are 329,000 new cases of Lyme Disease each year in the United States. Some experts believe the actual number of new cases could be as high as 1-2 million new cases per year in the US alone. 8) Lyme Disease has 6 times more new cases each year than HIV/AIDS, yet it receives less than 1% of the funding. I also wanted to share my cartoon awareness videos from last year. The first was made from my Skills I’ve Gained as a Lymie post. 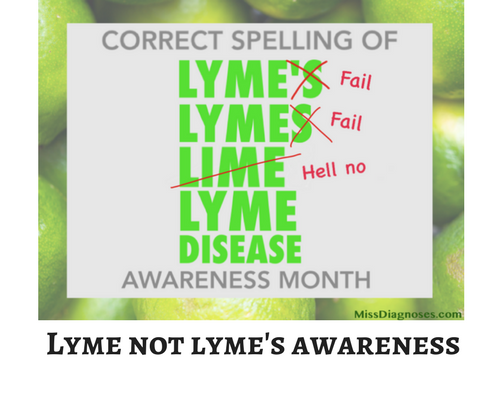 The second was made from my Lyme Not Lyme’s Disease Awareness Month post (spelling “Lyme” correctly is important). 😀 Both were originally created as Facebook slideshows by my awesome friend Lily from The Sleepy Girl Guide to Social Security Disability and then edited for YouTube. Please check out Lily’s fantastic blog for super-detailed, helpful information about applying for disability, getting Medicaid, getting homecare, finding accessible transportation, and everything else a spoonie needs to know.